If you’ve been teaching WriteSteps with fidelity, your students have been doing “test prep” all year. Every lesson gives them practice with the standards that will be tested. Here are just a few tips and tools to help you and your students as your state’s assessment approaches. Click the image below to download 3 Response Writing Posters. Have an idea for a poster? Send it to [email protected]. If we use it, we will send you and your grade level team a set for free! Emphasize the importance of rereading. Model this for students in all content areas. 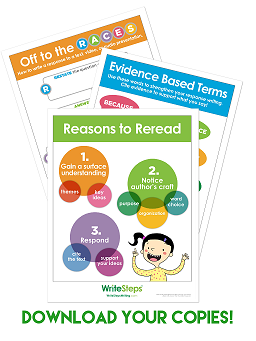 Use the resources in the WriteSteps lessons and download the Reasons to Reread poster in the packet above. Give students the opportunity to respond to a variety of media types—not just text. Find videos and audio recordings that are relevant to what you’re teaching. Have your students practice using context clues to determine the meaning of unknown words. Suggest using phrases like: the author said, in paragraph 3, according to the text, etc. Check out the Evidence Based Terms poster in the download packet! Don’t shy away from using “big words” with your students. Expose them to a wide range of terms when preparing writing prompts, e.g., article, excerpt, text, selection, key idea, central idea, and theme. Use words like narrative, explanatory, temporal and other terms from the standards in your daily teaching so that students do not feel overwhelmed with this vocabulary. Help them to remember “Off to the RACES”. Check out the RACES poster in the download packet. Encourage them to use this acronym to remember how to structure their response writing piece. 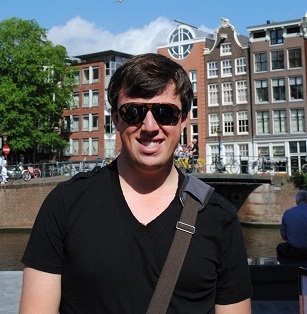 Christopher Walker, a 4th grade teacher at Williams Elementary, is this month’s featured teacher. Christopher is new to WriteSteps this year and a fan of CaptivationStation. Read on to see how easy the transition has been for him! WriteSteps: What is your favorite thing about WriteSteps? Christopher: I love that my students have the ability to work at their own pace while I am able to conduct multiple conferences with my students throughout each unit. WriteSteps: What would you say to someone who is shopping for a writing program? Christopher: I would tell them to stop shopping. WriteSteps is exactly what they need. 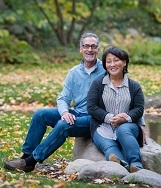 WriteSteps is a program with well planned units that build on each other. The CaptivationStation component of WriteSteps is a fantastic tool that helps teachers blend their students’ learning so that each student can set the pace of their learning. WriteSteps allows for differentiation among a wide variety of student abilities and is easy to use. WriteSteps is simply amazing. WriteSteps: What is the reaction of your students? Does this differ from other writing programs you have used? Christopher: Students take control of their learning, which causes them to take more pride in their work. With other writing programs, I felt like I was pulling teeth. 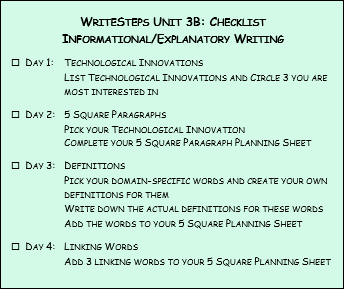 With WriteSteps I simply tell students it is time for writing and they begin on their own. They know what is expected and they know that they can accomplish great things if they push themselves. No more pulling teeth. WriteSteps: Many teachers tell us they feel more confident as writing teachers when using WriteSteps. Does that describe your experience? Christopher: Before WriteSteps, I would have described my ability for teaching writing as passable. I knew how to write. I knew how to teach the concepts of the writing process, but I was clueless as to how to put everything together in a cohesive way. Each day I did the best I could and hoped that it would have a good outcome for my students. With WriteSteps I feel confident in teaching writing. I can see the growth in my students’ understanding and in their ability to write just by looking at their pieces and discussing their writing with them. WriteSteps: Do you have any strategies or tips related to the teaching of writing that you would like to share with other teachers? Christopher: I use WriteSteps’ Captivation Station in a blended learning setting. I have set up a writing area in my room that facilitates my students’ independence. This area has everything they could possibly need: worksheets (pre-printed and organized in drop folders by day), pens and highlighters available in any color they would need, and a meeting place for discussing their writing with others. I also have created a step by step unit guide for my students to pace their learning. It has each day listed with a check box next to it and below each day are the things they need to complete. This helps my students stay on track. All of these things have really helped my students and me make the most of our writing block. If you would like to nominate a teacher to be showcased in our Teacher Feature, please email [email protected]. Register for this second teacher webinar in the series. Our Blended Learning Specialist, Joanna Van Raden, will discuss new ways to maximize your writing time. She will share tips and tools to ensure that you are making the best use of the technology in your classroom while differentiating your instruction to meet the needs of all students. 3-5 teachers, did you enjoy your free trial of Captivators, our daily instructional videos? Do you miss using Captivators? Would you like another chance? Give WriteSteps a “glow” on social media, take a screenshot, and send it to [email protected]. WriteSteps will give you Captivators free for the rest of the year. SPOILER ALERT!—second grade Captivators are in the works! If you’re using Captivators now and would like to let us know how it’s going, click here to complete a short survey! 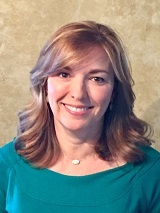 Last month, Joanna Van Raden, our Blended Learning Specialist, presented a webinar for teachers entitled, First Steps to Blending Your Writer’s Workshop. We’d like to welcome three new Awareness Ambassadors to our team! Sofia Scott lives in San Antonio, Texas and is married with two daughters. In her spare time she enjoys reading, traveling, and spending time with family and friends. Linda Sweeney lives in California and taught elementary school for seven years. After the birth of her second child, she went into Educational Sales. She missed interacting with students, so she ended up becoming a tutor. Now, 25+ years later she is still busy with both. When she’s not working, Linda enjoys planning trips with family and friends, hiking, and gardening. She is a volunteer with Make-A-Wish and active in several projects at her church. 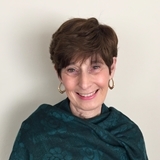 Sally VanEck lives in western Michigan with her husband where they enjoy kayaking, playing Pickleball, dear friends and family, and time with their precious grandsons. Kim Gates will be at the California Charter School Associaton Conference. Swing by Booth 410 and ask her to show you our new digital writing platform: CaptivationStation! WriteSteps will be at Booth 1014 at the ASCD Conference at the end of the month. Stop by and visit our exhibitor, Kim Gates, to learn more about what products WriteSteps has to enhance your writing and grammar instruction.